Russ knows first-hand how our services help people affected by spinal cord injury get the most out of life. Sixteen years ago, he sustained a T2 level spinal cord injury which left him paralysed from the top of his chest down. While he was recovering at the National Spinal Injuries Centre, Stoke Mandeville, a nurse introduced him to Back Up. They knew he was a very active person who played rugby for years, mountain biked and kayaked. He was keen on keeping healthy and seeking adventure, so our more outdoor-focused courses suited him perfectly. Russ kept in touch with Back Up, and he came along on our Colorado sit ski course five months after leaving the spinal centre. “It was a bit of a shock. I was up in the mountains and surrounded by people like me. The course just completely energised me – It made me learn that my injury wasn’t as limiting as I previously thought. Russ kept in touch with Back Up and he learned about our #RideforDanny challenge, which took place last year. Wanting to give something back and take on a personal challenge spurred him to sign up for the ride. Russ dived right into training for the ride. The London to Paris ride was a huge endurance challenge, so keeping his health in top shape became a priority. Being an outdoors person, he skipped the gym and opted to take his hand bike out for long rides along country lanes. His partner joined in with him on these rides, but he had to buy her a new bike just so she could keep up! Russ enjoyed these training rides, and he quickly saw the benefits on both his physical and mental health. “I was struggling with my rotator cuffs – a very common shoulder muscle issue among wheelchair users. Training on my hand bike helped strengthen my shoulder muscles, exercising them in a different way to everyday wheelchair pushing. Being mobile and getting your blood pumping may be something you don’t get to do as often while using a chair. Of course, even though Russ kept healthy and trained hard, there were still obstacles to be overcome on the challenge. The route from London to Paris spanned over 500km, and the ride took place on some of the hottest days of the year. There were precautions in place to ensure no riders were at risk of injury or illness, but this was still his most intense part of the challenge. “When you have no heat control due to spinal cord injury, some parts of the ride were a bit of a drama. Most injuries above T6 struggle with heat regulation, so that means I can’t sweat or keep my core temperature down. But all of the obstacles faced by Russ and the team were “absolutely secondary” to the immense feeling of satisfaction they got from completing the challenge. 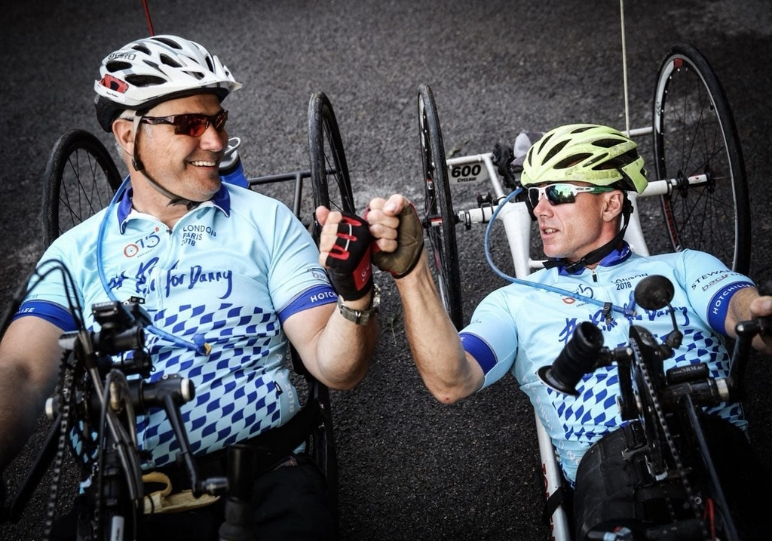 By the end of the last day, Russ and the other hand cyclists were leading the ride into Paris. Russ really enjoyed the social aspects of both training and the ride. He was able to socialise with other spinal cord injured people, and make plenty of friends. 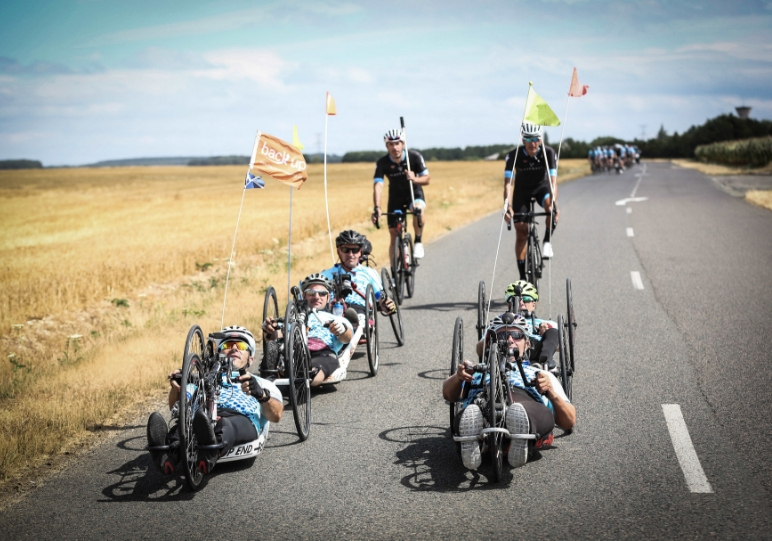 The London to Paris riders raised £130,000 – A staggering sum of money which will allow us to help even more people affected by spinal cord injury. If you want to take part in 2019’s #NoLimits ride – a thrilling 110km ride around Hampshire – visit our website or email Alex.